This print is so realistic that you'll believe you're out on a Fall evening years ago with Harvest Moon by Billy Jacobs. Pick the size that best fits your home. Frames are made of poplar wood painted black and assembled. Simply beautiful work! Thank you for choosing to shop with us and considering this beautiful print, Harvest Moon Print by Billy Jacobs, for your home! Billy Jacobs captures the memories of how laundry used to dried with this Spring Cleaning Print. Pick the size that best fits your home. Frames are made of poplar wood painted black and assembled. Simply beautiful work! Doc Warner's Farmstead is captured here by Primitive Artist, Billy Jacobs, under a blanket of snow. Pick the size that best fits your home. Our Frames are made of poplar wood painted black and assembled. Simply beautiful work! Enjoy Aunt Emma's Place Print by Billy Jacobs in the size that best fits your home. Frames are made of poplar wood painted black and assembled. Styles come in your preference of Round 1 3/4 inch or Deluxe (Flat) 2 1/8 inch. The advertising on the side of barns has dotted the countryside for over a century. Primitive Art of Billy Jacobs captures it beautifully with the “Mail Pouch Barn” print. Frames made of poplar wood painted black and assembled. A cool fall day on the farm is captured in the Primitive Art of Billy Jacobs with “Autumn Afternoon.” Pick the size that best fits your home. Our Frames are made of poplar wood painted black and assembled. Simply beautiful work! Billy Jacobs brings the focus of a treasure place in your memory with Grandad's Rocker. Pick the size that best fits your home. Frames are made of poplar wood painted black and assembled. Simply beautiful work! Billy Jacobs captures a familiar country scene with this Old Crocks Print. You'll can almost hear the crickets! Pick the size that best fits your home. Frames are made of poplar wood painted black and assembled. Simply beautiful work! Enjoy the Primitive Art of Billy Jacobs like “Snow Day” in the size that best fits your home. Our Frames are made of poplar wood painted black and assembled. Styles come in your preference of Round 1 3/4 inch or Deluxe (Flat) 2 1/8 inch. Enjoy the Primitive Art of Billy Jacobs like “Evening Chores” in the size that best fits your home. Frames are made of poplar wood painted black and assembled. Delivered in 10 to 14 business days. 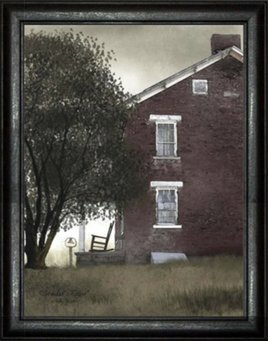 Enjoy the Primitive Art of Billy Jacobs like “1890 Farmstead” in the size that best fits your home. Frames are made of poplar wood painted black & assembled. Styles come in your preference of Round 1 3/4 inch or Deluxe (Flat) 2 1/8 inch.